Just in case we never get the chance to see our friends and family turned into zombies, an upcoming app will make it happen now. Coming soon to the iPhone and iPod touch will be George Romero's App of the Dead. It's attached to the famous zombie flick director to help promote the U.S. theatrical release of his upcoming film Survival of the Dead (though the film was already released in the UK on DVD and has debuted on video-on-demand). App of the Dead has two primary functions. First, it enables you to take photos of your loved ones and to turn them into zombies. 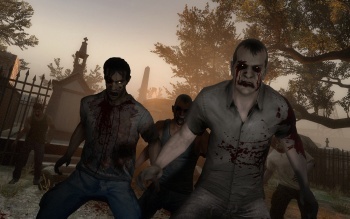 It boasts over 20 zombie features, such as open wounds and weird eyes. If it doesn't include an eye patch too, I'll be disappointed. Second, App of the Dead uses a separate in-game engine to allow owners to shoot their new zombified friends and family to death. Don't think you'll be able to kill your zombie mom before she can gnaw your forearm off? Get some practice in with App of the Dead. It's also being promoted to have "spectacular blood-spatter," which should help future zombie killers get over their fear of blood. These skills will be important someday, so maybe App of the Dead can help us learn them now. However, is it just me, or is the "of the Dead" title really losing its luster?